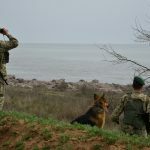 The staff of operational units of the Southern Regional Administration of State Border Guard Service together with representatives of the Odessa Border Detachment in the suburbs of Odessa, conducted a complex of actions directed on available information verification as for illegal stay of the foreigners on the territory of Ukraine. Thus, in one of the settlements of Ovidiopol district, Odessa region, a group of illegal migrants in number of 7 persons was revealed. They had no any documents. Four of them introduced as the citizens of Bangladesh, and three – citizens of Nigeria. According to available preliminary information, it was established that they illegally arrived to the territory of Ukraine from the Russian Federation and were staying in the country violating the applicable immigration laws. In the course of the interview it became known that some of them arrived to Russia this summer under the guise of the football fans and intended in future to enter illegally through Ukrainian territory to the EU countries for employment. Administrative protocols are drafted as for the detained migrants, identification actions are performed aiming in their further expell beyound the territory of Ukraine. This entry was posted in Translated Media-News from Ukraine and tagged Bangladesh, EU countries, Nigeria, Russia, Ukraine on September 11, 2018 by oksana.